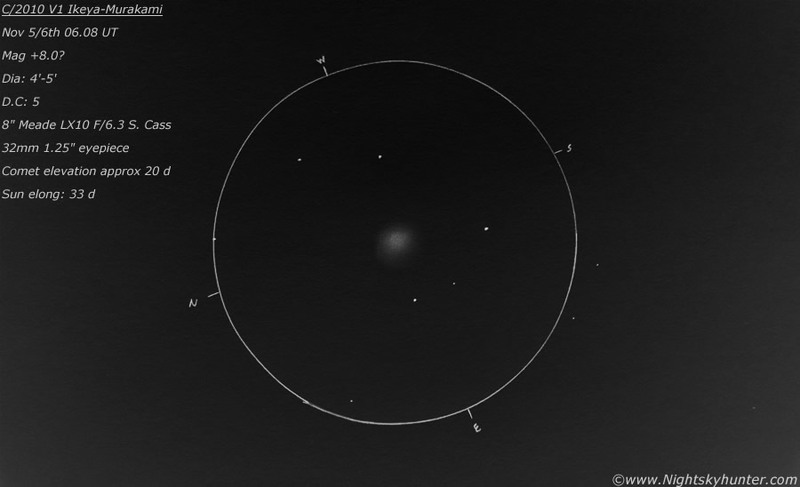 An exciting new visual amateur comet discovery had just been announced a day or so after a mysterious object had been reported on the NEOCP, it was soon confirmed as a new comet designated C/2010 V1 Ikeya-Murakami. It's location was low in the eastern pre-dawn sky within Virgo near the ecliptic very close to planet Saturn and naked eye star Porimma. I was very excited about seeing this new comet so I set my alarm for 05.30 UT on November 6th as the forecast promised a fine clear morning. The alarm did it's duty and I was out in the sharp morning air under a clear dark transparent pre-dawn sky, the conditions were great and the thick layer of frost on the car roof indicated that clean polar air was working to my benefit. I set up the Meade 8" F/6.3 S.Cass with 32mm 1.25" eyepiece in my back yard ready to hunt down the comet, I could see Saturn above my fence however the street light was located precisely over the comet's position and with dawn fast approaching I sensed that check mate was the only outcome. I decided to get mobile, defrosted the windows, split the telescope into two sections with the OTA in the passenger seat secured with the seat belt and the tripod in the back seat. I drove a mile or so into the Maghera countryside and found a good location on a narrow road on high ground looking across sloping fields to the east where I had a perfect clear horizon. The sky was cloudless, dark, and filled with rich star fields, however the deep blue glow of the twilight arch was already visible and slowly eating it's way up the sky so time was not a friend. The telescope was set up rapidly, I double checked the telrad alignment and pointed the glowing red bulls eye at the suspected position of the comet and began carefully sweeping around, within a minute I had found Ikeya-Murakami at precisely 06.08 UT, it was only a degree or so from Saturn and formed a small imaginary triangle between the planet and Porimma, the trio where only 20 degrees above the horizon. 2010 V1 was fairly easy to see however with the brightening background I found that averted vision served as the best tool. The coma was elliptical, well defined, compact, and moderately condensed at D.C: 5 with a diameter between 4' and 5'. I saw no striking colour other than the classic pastel grey so typical of telescopic comets, perhaps this indicated a higher dust to gas ratio in comparison to more vivid green comets like 103P/Hartley 2 which was also visible at the time. My rough magnitude estimate was +8.0 or perhaps fainter which was shy in comparison to the other values of +7.5 I had read on the internet during the previous evening. No doubt aperture effect and extinction had a role to play including the standard of one's sky. The comet had no bright condensation/disk at centre, a false nucleus, or tail and shared the field with a scattering of stars. I guided the scope a FOV or two to the N and there was glorious Saturn with rings and Titan, I swept back to the comet again and repeated the maneuver, it was amazing to see both objects so close during that magical hour of the night just before dawn. I drove back home feeling tired but very happy, according to my log book this was the 54th comet I have observed so I was delighted that my list was forever growing. I hope to see meet Ikeya-Murakami again on the next clear morning for one glimpse is never enough!